Below are the complete details of the Chemical Engineer jobs in Sukkur Beverages Private Limited in Sukkur . Skills Required for Job: Listening, Speaking & writing & analytical & problem solving skills. Qualification: Qualification must have relevant working experience similar job role.M.Sc degree holder additional qualification in office management is a plus and interesting candidate send their cv before this date. 19-12-2018. 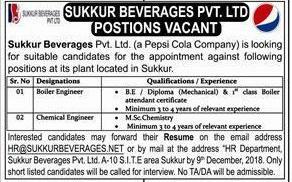 Chemical Engineer jobs in Sukkur Beverages Private Limited Sukkur, in Pakistan published on Paperpk.com from newspaper on December 02,2018. Job seekers who are already working as can also apply for post of Chemical Engineer.